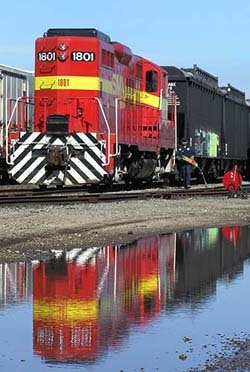 The Santa Maria Valley Railroad, serving the Santa Maria Valley's rail transportation needs since 1911, provides the most efficient, cost effective, and environmentally friendly method to transport products to any location in the continental United States served by our national railroad network. Products can also be transported to Canada and Mexico and to the ports for overseas delivery. The Santa Maria Valley Railroad is located about 250 miles south of San Francisco and 175 miles north of Los Angeles on the Central Coast of California. The Santa Maria Railroad's system consists of 14 miles of main line track interchanging with the Union Pacific Railroad in Guadalupe and serving Santa Maria and Santa Maria Valley. For customers without direct rail access, transload facilities are located at the Betteravia Industrial Park in Betteravia. The Santa Maria Valley Railroad has numerous sidings and spurs for future growth and capacity. The Santa Maria Valley Railroad connects with Guadalupe, California, interchanging with the Union Pacific Railroad. Through our Cooperative Marketing Agreement with the Union Pacific Railroad, we have direct access to integrated nationwide marketing, sales, pricing, operations and administrative strengths of the Union Pacific Railroad. The Santa Maria Valley Railroad provides daily freight service to our customers along our 14 miles of well maintained mainline track. Potential customers can learn more about shipping by rail here.